Did you ever want to create your own thug life photos like the popular thug life videos with cool gangster music, glasses, and hats? To do that easily, all you need is the right photo editing app on your phone. Because of the popularity of these apps, finding a photo editor for creating thug life photos and montages can be hard. Luckily for you, we did our research and we have to offer you a cool thug life photo editor that you will love for sure. 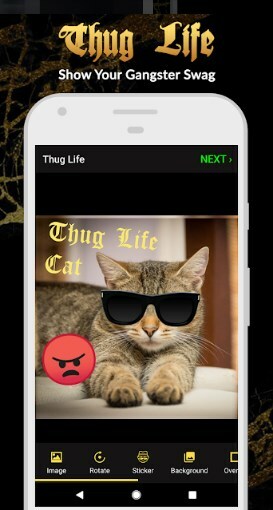 Developed for Android users, as one easy to use thug life photo editor this photo app allows you easily, in just a few seconds, directly on your photo to create your own or photos of your friends as the coolest and unique thug life photos, collages and montages. Fill your photos with cool hats, glasses quotes, turn yourself into your favorite rapper and much more with just a tap. Enjoy, entertain yourself and your loved ones, and use the app to add thug life stickers, filters, and frames to your photos. Download the app now on Google Play for free to fill your photos with the gangster thug swag!